Upgrading from a current Level 1 Credential (CAS or AC) to a Level 2 Credential (ACAS or AAC) is easy. Simply follow the steps outlined below to get started today. 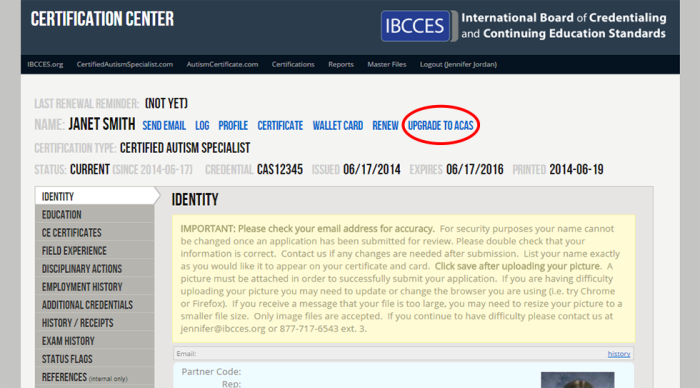 From your Account Dashboard, select Upgrade to ACAS (or AAC) near the top of the page, as shown above. Follow the onscreen directions to submit your payment online and begin your Advanced Level 2 Certification. Instructions for completing the Level 2 Certification will be sent to you along with access to the Level 2 Online Training.